RIO DE JANEIRO – One of the biggest events in the Brazilian fashion calendar kicks off this week with the opening of the 17th edition of Fashion Rio, featuring major Brazilian designers as well as introducing some of the most exciting emerging young talent. The event runs from Thursday May 27th to Tuesday June 1st at Praça Mauá, showcasing the hottest collections for Spring/Summer 2011. The catwalk comes to Praça Mauá this week with the 17th Fashion Rio, photo by www.ffw.com.br. The theme for this year’s edition is ‘360º City on the Move’, and precedes in its own inimitable way São Paulo’s June Fashion Week where the tastes tend to be smarter and sharper, in contrast to Rio’s more laid-back approach to life and fashion. “Rio, like fashion, is in constant motion. 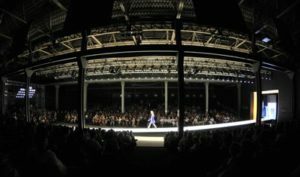 We’re in a city that is constantly looking to the world, and in its focus too,” says Paulo Borges, CEO of Luminosidade, the company that organizes both Fashion Rio and São Paulo Fashion Week. With shows scheduled from 4PM to 11PM daily, there is a packed program of exciting designers including the first Fashion Rio outings for labels Triya and British Colony, and the return of Isabela Capeto, O Estudio and beachwear label Blue Man who have also shown in São Paulo in recent seasons. OEstúdio will be returning to Fashion Rio after recent seasons in São Paulo, photo by www.ffw.com.br. Opening up the event on Thursday is Walter Rodrigues. Better known for his simple, chic designs, this year he is set to add an unusual talking point by only using only black models on his catwalk, according to his press agency’s latest release on Monday of this week. Footwear designer Melissa, meanwhile, has been working in partnership with Italian architect Gaetano Pesce, creating some impressively outré shoes that are set to hit the shops in August. The Italian arrives in Rio this week to personally promote the new design. Top models rumored to be parading at this year’s event include Carol Trentini, a favorite of US Vogue editor Anna Wintour, as well as the transsexual Roberta Close, but the majority of the designers continue to remain guarded about the details of their shows for maximum impact once the flashbulbs start. The rich history of the Port area in which Fashion Rio once again takes place is also the focus of a photography exhibition commemorating the centenary of its construction. Warehouse 2 hosts the images that take a look at the development of the region and the plans for its future transformation back to something resembling its former glory. The visual design identity of the city is the focus in Warehouse 3 with images from Instituto Moreira Salles. Amid the building and rebuilding of the city, an enduring motif of waves, curves and bodies developed and became immortalized on the sidewalks and fixed in the imagining of Rio. An exhibition of photographer Bruce Veiga’s work will show examples of this beautiful creativity. Two further style events will also be happening alongside Fashion Rio: The 16th Rio-À-Porter, the industry buyers event that brings together over 250 fashion brands, and Joia Brasil, a contemporary Brazilian jewelery design festival. With investment in the event estimated at R$13 million, the anticipated 90,000 visitors over the six days of shows are in for a treat. As a lavish style showcase in Brazil’s international urban beauty spot that invites designers and visitors to contemplate Rio’s transformations – past, present and future – Fashion Rio Spring Summer 2011 looks set to be a vital, exciting event in the Rio events and global fashion calendars.